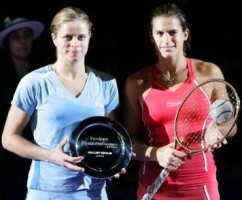 On Sunday in Antwerp, Belgium, in the final of the Proximus Diamond Games, the 2005 champ, 26-year-old 2nd-seeded # 2 Amelie Mauresmo of France (residence: Geneva, Switzerland) won again, defeating 22-year-old top-seeded # 1 Kim Clijsters from Bree, Belgium, 3-6, 6-3, 6-3 (Amelie is shown with the Proximus hardware after the match-- the first player to win the tourney three times in a row will keep the diamond-encrusted racquet, so Amelie will be playing for it next year). Kim has not yet completely recovered from the right ankle injury she sustained during her Australian Open semifinal against Amelie (and although she did not mention it after the final Kim aggravated the injury during the tourney, leading her to withdraw from her next scheduled event, the Pacific Life Open in Indian Wells, where she would have been defending her 2005 title). Kim said: "I started the match very well, and even took a break ahead at the start of the second match, but from then on Amélie started playing better and making less mistakes. She constantly put a lot pf pressure onto me... Mauresmo clearly is in good shape. She is very considerate in building her rallies, but you won't see her play a lot of winners. Since the end of last year she has become a lot stronger mentally. I believe she has earned the victory. It is frustrating sometimes to know what you are capable of, but not able to do for the time being." 2005 US Open champ Kim has won 30 WTA singles titles in 44 finals; 2006 Australian Open champ Amelie has now won 22 WTA singles titles in 39 finals. Kim still leads Amelie 8-5 in career matches, but Amelie has now won the last three times they have played.. In the Bangalore, India final on Sunday, 3rd-seeded # 57 Mara Santangelo from Cavalese, Italy, playing in her first WTA singles final, won her first title by narrowly defeating 24-year-old 6th-seeded # 69 Jelena Kostanic from Split, Croatia, 3-6, 7-6(5), 6-3 (photo shown). Jelena is now 0-3 in WTA singles finals, but she has been playing very well recently, also reaching the final last week in Pattaya. She was slowed, like other players this week, by a gastrointestinal problem. Jelena said: "When you are tired you cannot produce. But I am happy with the way I was moving in the court. It is much better than last year. I am still working on my fitness. In the beginning of the second set, I had no energy to play. My shots were not quick. My mind was rushing as I was fighting food poisoning. Still, I am satisfied with my game. It is good luck that I reached the final." (Feb 14, 2006) # 6 Mary Pierce has withdrawn from the Antwerp tourney, apparently due to the right foot achilles tendon pain that troubled her during the final in Paris. Lucky Loser # 108 Eleni Daniilidou (the highest-ranked player available of those who lost in the qualifying finals) has replaced Mary in the main draw. Antwerp time is GMT (UCT, ZULU) +1 hours (Pacific Time+9, ET+6). Early round play starts at noon local time. The Bangalore tourney is new this year, replacing the tourney in Hyderabad. Bangalore time is GMT (UCT, ZULU) +5½ hours (Pacific Time+13½, ET+10½). 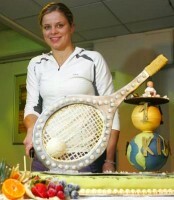 that apple sauce does make a good mix with carrot juice, while Kim Clijsters avoided all such intoxicants. 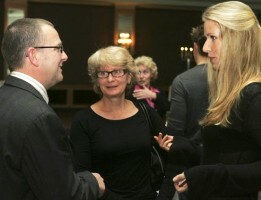 Later, Elena Dementieva explained to Bob that if he really wanted a date with her mom, he should check with her dad first. Kim said: "It was a very exciting match and then you'd rather win of course. Golovin was very strong, but I kept on fighting. The audience was a huge support. In the tiebreak of the second set they really shouted me towards winning it. Tatiana said: "Of course I am disappointed, I was so close. But it is better to lose after such a match than after twice 6-0. Kim was absolutely solid at decisive points and was playing very aggressively throughout the whole match. I also think she was serving very well, especially during the second set." Kim said: "I started off better tonight than in the first match. I had three really good games, but then I couldn't keep it going. I'm still not consistent enough, and I haven't been getting enough first serves in. I'm still suffering from a bit of a cold, which hasn't helped. 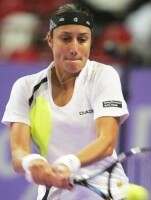 But tonight Dinara put me under a lot of pressure, so I definitely had to play a level higher than in the last round." #6 s3 Mary Pierce FRA achilles? Shahar said: "I was tired mentally after the Pattaya Open. It was humid there and the weather is dry here. But I have no excuses as Camerin played really well today." 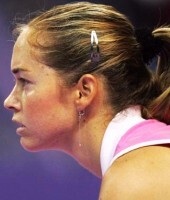 Anastassia said: "In the second set [Sybille] clawed back with good serves. I remained consistent with my game. It was not easy to beat a seeded player." Mariya said: "[Aiko] played really fast and hard in the first set. Playing her was very difficult for me, so I just started to enjoy it and that seemed to help. "I was fighting for every ball, but in the first set, I was hitting too short and making too many errors. In the second set, I didn't change my game, just got more consistent. I knew what I wanted to do; it just had to come together." Nicole said: "I had to apply constant pressure on the serve; that was the key to the match, not giving [Elena] the same ball, and mixing it up. It's such a power game now, and the girls hit through the ball so hard. I'm not that big and I can't get the winners that way, so I have to rely on experience and a few tricks I have up my sleeve." Sania said: "I take my hat off to her. [Camille] played the game she needed to play to win. I didn't know what to do out there, as she gives you no pace at all. I had to generate everything." Mara said: "It was a very tough match. I had a lot of chances in the first set. Sometimes you do the right thing and end up losing. That is what happened in the first set. I tried to hang on there and try and fight every point. I tried to be aggressive and made it a point not to lose my concentration. It worked. It was tougher than expected." 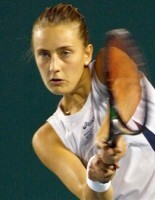 Jelena said: "I am coming in from Thailand where the Pattaya Open was held. It is tiring. During the second set, I lost a bit of focus. Otherwise, I must say I cannot wish for something better than this win. I hope I continue to play like this for the rest of the year." Melinda said: "It was tough as Koryttseva's game was unpredictable. She kept committing a lot of errors. My serving was good throughout the game." Vania won despite suffering from gastrointestinal illness, and withdrew from her doubles match later in the day. Vania said: "It was a tough match. I wasn't feeling great out there. I don't think I lost concentration in the second set after having 4-2; I think it was more that [Camille] started to make some good shots. Camille said: "I think I gave it all in my [2nd round win over top-seeded Sania Mirza]. I managed to come back a little in the second set at 2-4, but I didn't have the energy to pull off [the] turnaround that I managed on Wednesday." About playing Jelena Kostanic in the final, Mara said: "It's going to be very tough for me. I've never beaten her and she's full of confidence as this is her second final in two weeks. I'm going to have to play my best tennis for sure." Jelena said: "In the first set, [Melinda] wasn't playing like she could, then she settled down and started to play like I expected her to. Then I got tired and lost concentration and lost my serve. Other than that I served well in the match. "She likes it when you play hard and flat, so I mixed it up and played a lot of slice, she didn't like that so much." You can link to many Real Video postmatch interviews of WTA players from Grand Slam tournaments at the 2006 WTA Player Interviews page. the current top 20 Women's Tennis rankings with player photos, links, and bio info.